Update: To spread the love a little, we are now giving away a Blu-Ray Disc every Monday to our blog and Twitter followers. Last week, we gave a copy of Hurt Locker to @melspur on Twitter. 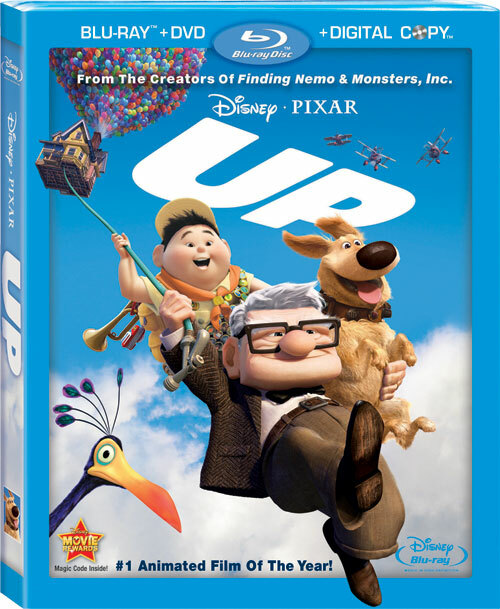 Today, we are giving away a copy of Disney Pixar’s Up! To enter, simply leave a comment stating what your favourite animated film of all time is. The highly-anticipated Oscar nominations for 2010 have finally been announced. Four of the ten nominations for Best Picture are already (or imminently) available to watch on Blu-ray, equipped with plenty of special features for delving into the reasons these films have received critical acclaim. Both The Hurt Locker and Up (released in Europe this month) have special behind the scenes footage presented in high definition. In Up for example, one of the many short documentaries shows how the Pixar team developed their 78-year old action hero and the efforts they went through to accurately convey his moves. It also contains BD-live feature The Global Guardian Badge Game, which gives kids and families a chance to brush up on their geography skills. On the Inglourious Basterds Blu-ray, a roundtable discussion with director Quentin Tarantino, Brad Pitt, and film critic Elvis Mitchell is worth a watch, for additional understanding of the films’ premise. Finally, the District 9 Blu-ray provides the option to watch the film with BD-Live features MovieIQ and Cinechat, as well as including several behind the scenes documentaries (all in HD). All in all, the special features on these Oscar nominated Blu-ray Discs will ensure you are fully equipped with all the information to choose which you think is most deserving of the top prize. The question is, will your favourite win? The British Video Association today announced that for the first time Sony Pictures Home Entertainment, Twentieth Century Fox Home Entertainment, Universal Pictures UK, Walt Disney Studios Home Entertainment UK and Warner Home Video have come together to produce an advertising campaign dedicated specifically to promote the Blu-ray Disc format. Created to raise awareness and excitement, the Blu-ray “What are you waiting for?” commercial features footage from some of the season’s most anticipated new Blu-ray Disc releases – Terminator Salvation, Ice Age 3, Inglourious Basterds, Snow White and Harry Potter and the Half Blood Prince – and will be seen by 40 million UK consumers in the run up to Christmas. The advert, which forms part of a bigger campaign, including a re-launch of the Blu-ray website thisisbluray.co.uk, will run across all major television channels throughout December. Further details can be read here. Universal Studios Home Entertainment has announced two new applications designed to add greater user interactivity and immersion to its upcoming slate of Blu-ray Disc releases. The Pocket BLU app for iPhone and iPod Touch is available now as a free download from the Apple App Store, and uses the device’s Wi-Fi connection to communicate with a network enabled BD player. Once connected, users can use their iPhones or iPods as a remote control, giving easy and direct access to different menus and BD-Live content. It also allows users to access a video timeline to jump to any point in a movie, and to download exclusive bonus content. A pop-up keyboard also makes it easier to chat and send messages when the option is available. Social BLU meanwhile integrates Blu-ray Disc content with social networking applications such as Facebook and Twitter. Supported discs, starting with American Pie presents: The Book of Love, will allow viewers to login to their chosen network and enjoy a variety of features, including direct status updates via BD-Live. Users can also rate films, send messages and share content from the portal. Upcoming Universal releases to use the new applications include Bruno, Funny People, 9, Public Enemies and Inglourious Basterds. More information will appear at www.universalhidef.com as the discs are released.